The wok is an amazingly versatile kitchen tool, but all too often it's under-used and unappreciated. I Love My Wok reveals how you can use just this one pan to make over 100 delicious international dishes, including Thai, Japanese, Chinese, Vietnamese, and Indian classics. The recipes run the gamut-apps, soups and snacks, salads and sides, noodles and rice, meat, poultry, fish, and veggies. You'll learn a variety of techniques, from steaming to stir-frying, braising to smoking. And there's a primer on wok basics, including seasoning, maintenance, and essential tools. 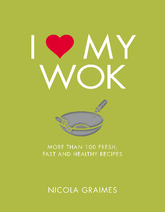 Whether you want a spicy curry, a speedy stir-fry, a succulent soup, or a tempting selection of dim sum, the wok will become your go-to wonder pan! Color photos.